I met BlabDroid and its brilliant creator, Alexander Reben, at a recent robot conference, where one can’t help but fall for the loveable Droid (it was tough for me not to, but I was able to restrain myself and maintain a professional relationship in the hopes that BlabDroid would someday be my patient). 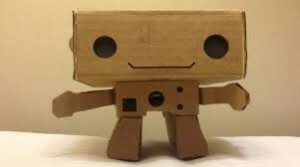 At first glance, BlabDroid appears to be a cute toy-ish robot made out of corrugated box. However, this little brains-on-board-its-cardboard robot is equipped with sensors and a high resolution video camera that interacts with humans via programmable personalities to create the world’s first documentary shot and directed by robots. The epic videos don’t shed light on BlabDroid’s private life (that’s only for me during confidential sessions), but rather, on the human condition. In an Eliza fashion, BlabDroid befriends strangers and asks them deep, personal questions that the human interviewees not only choose to answer, but in many instances, for the first time, divulge their secrets to. Originally developed as part of a master’s thesis at the MIT Media Lab, Reben’s BlabDroid proves that people need and want a safe medium to vent to, without the risk of an inappropriate (in the eyes of the revealer) human response. BlabDroid helps us to consider the roles of robots as companions and raises some interesting legal and ethical questions that our society must inevitably address. Which, if any, information will our robot buddies need to reveal to authorities (suicide, murder, terrorism), and how will that be determined; or will robots have a modified ‘Seal of Confession’?